"Tron" was shot 65mm 2,2:1 aspect ratio for all scenes. 65mm color for all the "real world material," and 65mm Black and White for all the material that was later composited into the "electronic world". All of the material was composited into VistaVision before being blown up to a 65mm IP which was intercut with the IP struck from the cut 65mm EK negative. All of the CGI material from MAGI and Triple I was recorded out to VistaVision and was intercut with all of the other composited material. "The Making of Tron" book has a very accurate flow chart of how the film was all put together. While there were a couple of anamorphic shots, and a couple of full aperture ("Super 35" before it was called that) cuts, the entire film, for all intents and purposes, was originated on 65mm film. VistaVision CGI and all electronic world composites shot on VistaVision animation stands were blown up spherically into a 65mm IP. The other "couple-o-shots" of anamorphic and full aperture were also blown up to a 65mm IP where it was conformed into a single ribbon 65mm IP. 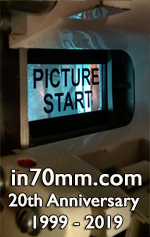 For the 70mm printing, a contact 65mm inter negative was produced. For 35 mm release prints, a 35mm reduction anamorphic inter negative was produced, with a bit of compromise on the composition, in that the 35mm prints had a bit of the top and bottom sliced off, turning the film into a 2.40:1 aspect ratio. The original compositions were optimized for 70mm printing, and all shots were composed to the 2.2:1 aspect ratio. The other films mentioned were all originated in 35mm anamorphic. Those other films have no chance of competing with a good print of "Tron"'s 65mm color originated scenes. The balance (and by far the bulk) of the film was subjected to more optical steps than I care to think about, and for its day looked spectacular, all things considered. That being said, the B&W original material added quite a bit of grain/texture to the electronic world material, which explains the difference Mr. Gutzeit is seeing in those composites vs. the ones from "Blade Runner" for example. All but a couple of "Blade Runner"'s visual effects shots originated on 65mm color negative. In fact, as I recall (I worked for EEG as well...) in the final 70mm printing versions for "Blade Runner", the live action anamorphic was blown up to a 65mm IP, and intercut with a contact 65mm IP from the final effects composites. That was how the 1982 70mm release was handled; I can't speak for any subsequent re-releases, but I think it unlikely that effort was ever repeated. Rob Hummel, Exec Vice President Digital Development Technicolor. Editors note: Mr. Rob Hummel was the laboratory coordinator and post production supervisor for "Tron". Would you like to read the question?